White pine is a large North American evergreen tree; reaches a height of 150 feet or more, the tree is covered with deeply fissured, gray-brown bark. Its branches are arranged in regular whorls. The soft bluish-green, needle-like, linear leaves grow in clusters of five, the clusters spirally arranged on the branches. The male flowers grow in axillary, catkinlike cones, the female in slightly larger lateral or nearly terminal cones. The slender, cylindrical seed cones are from 3-8 inches long and are often curved. The winged seeds are brown, mottled with black. Grows from Newfoundland to Georgia mountains and central Iowa, west to northern Illinois. 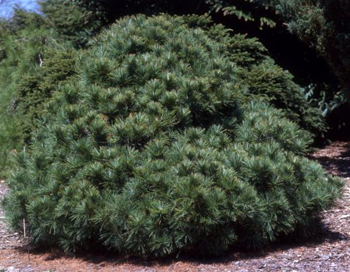 The Native Americans used white pine for making a bread from the ground-up bark. Long been used for lumber and wood pulp, the timber has been used for ship masts, houses, other buildings. 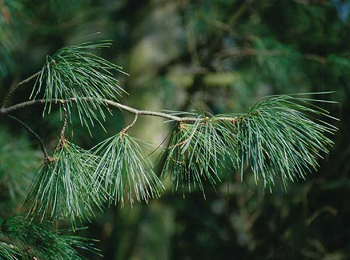 The inner bark off white pine is a remedy for coughs and congestion due to colds and bronchitis, flu, croup, laryngitis, as a tea or as an ingredient in cough syrup. Some Native American tribes used the inner bark or the sap as a poultice or dressing for wounds and sores. Pitch poulticed to “draw out” boils, draw embedded splinters, felons, abscesses, also used for rheumatism, broken bones, cuts, bruises, and inflammation. Twig tea used for kidney and lung ailments. Bark and/or leaf tea used for sore throats, poulticed for headaches. Combined with uva ursi (bearberry), marshmallow, and poplar bark, it is excellent for diabetes. A hot resin can be spread on a hot cloth and applied as you would a mustard plaster for treating pneumonia, sciatic pains, and general muscular soreness. Infusion: steep 1 tsp. inner bark or young shoots in 1 cup water. Take a mouthful at a time, as needed. Add a little honey for sweetening if desired. Tincture: a dose is from 2-10 drops in water. Mixture: steep 1 tsp. white pine inner bark and 1 tbsp. each of wild cherry bark, sassafras bark, and American spikenard root in 1 pint of boiling water for 30 minutes. Take 1 tsp. every hour. A ready-made combination of pine with other herbs is available at many herb shops, with the directions for use on the container.